Hidrostal Pumps markets, sells, supports, assembles and services Hidrostal products for the North American market. We carry an inventory of parts, assemblies and motors to serve our customers for new orders and aftermarket. Hidrostal pumps have been sold in the United States since the 1970s. An initial sales agreement was concluded with Wemco/Envirotech in 1981. The Weir Group acquired Wemco in the 1990s and began selling Hidrostal pumps under the Wemco brand. Weir Salt Lake City (and their predecessor companies) represented Hidrostal in the USA and Canada as a sales partner, but have never manufactured Hidrostal pumps or motors. Based on our sales strategy we decided to form Hidrostal USA in 2015. This decision was part of the ongoing process to better serve our customers and have a more direct relationship to the North American market. 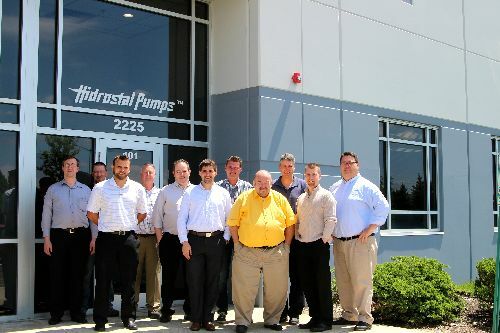 Hidrostal Pumps is located in Aurora, Illinois and cooperates with independent manufacturers representatives and distributors across the USA and Canada. The pumps and motors sold by Weir under the brand name «WEMCO-Hidrostal» or similar were solely produced by Hidrostal. The screw centrifugal pumps and motors currently offered by Weir and branded as «WEMCO» are not designed, manufactured or supplied by Hidrostal, nor do they share the time tested performance of the ORIGINAL Hidrostal products. Please do not be fooled by sales information designed to confuse these facts. We do not assume any warranty or liability for those products nor stand with our good name behind them. Their design and manufacture lies only and exclusively in the responsibility of Weir and have no affiliation to Hidrostal. To be assured to get the «ORIGINAL» Screw Impeller Pump that has been designed, engineered, tested, manufactured and field proven for 60 years, specify only HIDROSTAL.